Originally published in “It’s About Times,” the Abalone Alliance newspaper, May-June 1982, p. 6-7. 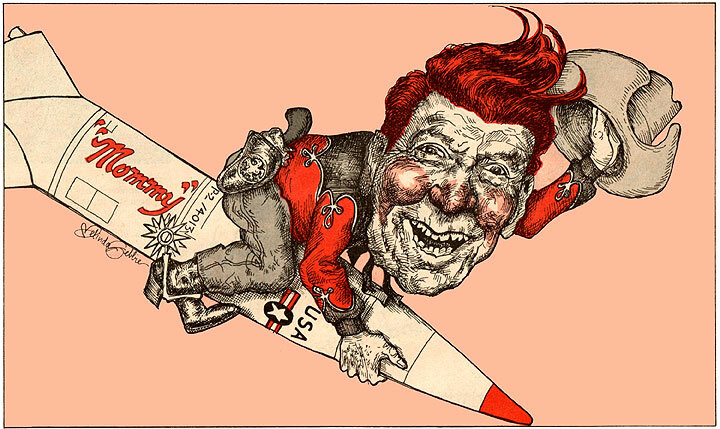 Cowboy Ronald Reagan on missile. Cartoon by Melinda Gebbie, originally published in "It's About Times." At long last the public's passions have been aroused and aimed at the horrors of nuclear war. This is immensely encouraging, and not only because if we protest we may survive. The protest and resistance may yet be turned against the social system that foists on us a good deal of unpleasantnesses in addition to nukes. Still, an aroused populace is not necessarily a discerning one. Groundswells driven by fear and moral fervor can quickly ebb away or be sidetracked by image manipulation from on high. 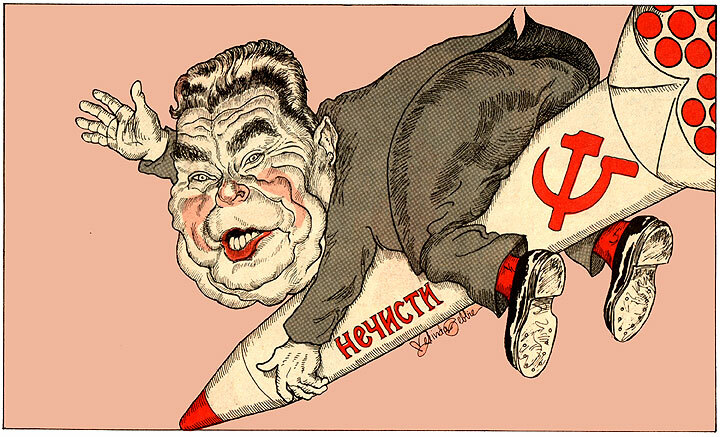 USSR Community Party leader Leonid Brezhnev on missile. The growing ranks of disarmers have already forced Reagan to temper his overconfident' bellicosity and advance "bold new" arms control proposals. While he is still drawing deeply from the bag .of tricks filled with missile gaps, windows of vulnerability and the Russians-are-coming, the president has opened a second sack of illusions. This one, every bit as well-worn as the first, contains heartfelt declarations of shared goals and promises of negotiations for arms limitations. Reagan, too, wants to be a Man of Peace. The majority of disarmers will see through the crude sleight-of-hand that Reagan is proposing: to proceed with a vast military buildup in order to talk about reductions at some unspecified later date. In fact, they need only read the San Francisco Chronicle of May 8; which reports that "senior administration officials" describe Reagan's proposals' as "an effort to turn public attention away from the antinuclear movements in the United States and Western Europe." Other politicians have come up with "arms control" schemes that are fractionally less obscene than Reagan's. Teddy, Kennedy, for example, wants to exchange a nuclear freeze for increases in conventional arms and armies. There will doubtless be many more proposals, and the carefully crafted illusion of arms control will be dusted off and shined up. The coming arms control extravaganza represents nothing new. Between World War II and 1980, officials of the US and the Soviet Union met over 6000 times to discuss arms control. Yet the superpowers have not been able to agree on eliminating a single existing weapon. The nuclear buildup has survived a Test Ban Treaty, an ABM Treaty, a SALT I and a SALT II. It has weathered storms of public protest almost as easily as it profited from the more common climate of apathy. Instead of reversing toe arms race, these 6000 meetings have institutionalized it. In all these meetings, there have been only a few fleeting episodes in which the superpowers came close to even partially diverting the arms race. These moments of opportunity were found and lost in each side's shifting perceptions of its military and political advantage. And each side has kept at least one eye focused on its image as a seeker of peace, a focus that sharpens considerably, as it is sharpening today, whenever protest erupts. In the service of the ruling class, history is best obliterated while illusion is made resilient and recyclable. Taking advantage of this modern axiom, Vice President Bush pointedly recalled in a recent speech how a generous American proposal for stopping the arms race before it started was met with “a loud 'nyet'” just after the .end of World War II. It is true that many Americans at the time were anxious to bring the atom under cooperative international control. Even before the 1945 attack on Hiroshima and Nagasaki, some of the scientists who created the Bomb tried to prevent the dizzying nuclear arms race they correctly predicted it would set off. In June of that year, a group of them submitted a memorandum known as the Franck Report to Secretary of War Stimson, asking that the first public demonstration of an atomic explosion take place on a remote deserted site rather than over a Japanese city. The report also suggested that the US then renounce the use of this weapon if other nations would do the same. These suggestions were not given serious consideration. After the Hiroshima and Nagasaki devastation, more scientists, a significant percentage of the public, and even some politicians concluded that the secret of the atom must be shared among all the nations of the world if disaster was to be avoided. Stimson himself, who had supported the bombings, proposed an "atomic partnership" with the Russians. But other policy makers had quite different ideas. General Leslie Groves, the military overseer of the wartime bomb project, was typical of those who pushed for a hefty military share of the control of the atom. This was the same crew that strongly opposed international cooperation in nuclear development. A debate between them and proponents of civilian and international control raged for months in Congress. In 1946, Congress passed the Atomic Energy Act, making it illegal for American scientists to continue to share nuclear information even whose even with England or Canada—whose scientists and engineers had made larger contributions to the wartime effort that produced the Bomb, and who, after all, were America's closest allies. The Act also gave the military much of the control over nuclear development that it wanted. Still, there continued to be so much high-level sentiment for international control of the atom that the US submitted to the United Nations what now seems a drastically liberal proposal. The first version of what later became known as the Baruch plan declared that the United States was willing to submit to a world authority for the Atomic Era. The Soviet Union was not impressed. Some historians attribute its wariness solely to Stalin's paranoia. The fact is that the "world authority" would' have been constituted through the United Nations, which at that time was effectively controlled by the Americans. Russian suspicions grew -- with growing reason -- as the plan went through several revisions, each considerably less magnanimous than the last. One of the early but already fatally flawed versions of the plan was drawn up by a group of scientists, military men and executives from corporations which had played key roles in the Bomb's development. The major drawback of this plan was a requirement that the Soviet Union immediately hand over control of its uranium deposits to the "international authority." The US was asked only to promise to share its nuclear secrets and stop producing bombs at some unspecified future date, whenever the international body could agree on a permanent treaty. The plan was further butchered when President Truman chose financier Bernard Baruch to translate it into "more workable" terms. Baruch's yet more hawkish group insisted on a provision for "swift and sure punishment" of any nation that violated the ban on nuclear development. This threat was clearly aimed at the Russians. who had already begun a frantic scramble for a nuke of their own. In the words of journalist I.F. Stone, by this time the proposal “must have seemed to Moscow the blueprint for a world capitalist superstate which the US would retain its atomic monopoly behind the façade of an international organization under US control." Dean Acheson, then Undersecretary of State and one of the authors of the plan admitted years later that the Baruch revisions "meant certain defeat of the treaty by Soviet veto." The Soviet counter-proposal, offered by its UN delegate Andrei Gromyko, called for the destruction of all nuclear weapons in existence and the cessation of their production. The American response came four days before the formal rejection. On July 1, 1946, the US set off its first postwar test explosion over Bikini Atoll. Alva Myrdal, a Swedish diplomat who spent twelve years as an arms controller and then wrote a book called “The Game of Disarmament: How the United States and Russia Run the Arms Race,” writes of this period, “The pattern… had been set: both sides would present proposals for disarmament agreements, of often wholesale dimensions, but would be careful to see to it that these would contain conditions which the opposite side could not accept. The next serious sidling up to arms control came in 1955, after the arms race had gained considerable momentum. The Russians had exploded their first atomic bomb in 1949. The US detonated the first hydrogen bomb, massively larger than the fission type, in 1952; the Russians matched this feat a year later. Arms negotiations had been stuck for years on the issue of inspection of military sites: the US accused the Russians of wanting disarmament without inspection, while the Russians felt that US proposals called for inspection without disarmament. Then, in the middle of arms control talks being held in London, the Soviet Union suddenly announced it would agree to the West’s plan for international inspection of military sites and to its figures for ceilings on conventional armies. The new Soviet position was virtually plagiarized from British and French proposals, which in turn closely reflected the American view. European diplomats were jubilant at the breakthrough. "It's almost too good to be true," the French delegate enthused. The American and British delegates both issued statements confirming that the Soviet proposals were in large measure the same as what theirs. In Washington, however, the response was strangely restrained. President Eisenhower began making speeches questioning the wisdom of letting Russians inspect US military sites. After a recess, the US delegate returned to the London negotiations to announce the withdrawal of every previous American proposal -- including the ones that were so close to what the Russians now said they'd go along with. The Russians had agreed to every substantial American condition, and the response from the US was that it hadn't really meant it that way. It was this "no," not a "nyet," which scuttled the closest approach to a real arms control agreement ever. Shortly afterward, a new factor entered the arms control equation. Popular protest against nuclear weapons, which had been extremely muted during the decade following the war, made an appearance. The catalyzing event for the protest was a 1954 American nuclear test on the Bikini Atoll. Fallout from the multi-megaton explosion, blown by the wind in an unanticipated direction, rained onto hundreds of Marshall Islanders and a Japanese fishing boat called the Lucky Dragon. The Marshallese were quickly moved to another island by the US Navy, but many fell ill. (They and their children continue to feel the effects of their exposure to this day.) All the fishermen got radiation sickness, and one died of it six months later. The fate of the Lucky Dragon instigated an investigation of the health effects of radioactive fallout. Many prominent scientists, including Albert Einstein and Linus Pauling, supported the disturbing findings, which launched nearly a decade of protest against atmospheric testing. Unfortunately, the danger from the use of nuclear bombs on real targets was either too little understood or too overwhelming to be targeted by the anti-testing campaign. It was the cancer predictions and the strontium-90 in the baby's milk that evoked a frenzy of fear and widespread dissent. The peace movement picked up the ball and ran. It looked like a winning strategy: concentrate on the fallout, downplay the possibility of nuclear holocaust, and ignore the politics of the the arms race. By the late 50's, a campaign to push for a comprehensive test ban treaty was well underway. It won the backing of significant majorities in the United States, Western and Eastern Europe, Japan and many other countries. In Britain, ban-the-bomb sentiment grew into a movement, with sit-ins, rallies, and huge demonstrations like the Aldermaston Easter March in 1960. A group of "nonaligned", countries, responding to anti-Bomb sentiment in their own backyards, worked out a detailed plan for a comprehensive test ban treaty. Most of non-nuclear countries declared themselves willing to sign a multilateral ban, despite the fact that it would hamper their efforts to develop nuclear weapons, institutionalizing the superpowers' monopoly. The protests and negotiations lasted for several years. These were years during which the arms race passed several important mileposts of escalation, with unfortunately little reaction from the testing preoccupied protest movement. The superpowers first stopped the atmospheric tests, then, led by the Russians, started them again. The Russians launched the Sputnik and shot down an American U-2 plane secretly spying over its territory; Eisenhower warned of the military-industrial complex; Kennedy invented a fictional "missile gap" and faced down Kruschev in the Cuban missile crisis. Finally, in 1963, the Russians again backed down on a long- held negotiating position. This time they gave up their insistence that an agreement cover all kinds of testing. Abandoning the ongoing multilateral efforts to achieve a comprehensive test ban, the US and the USSR began bilateral talks in Moscow. Within weeks, they had concocted a partial test ban treaty. The partial ban merely moved the tests underground. It was by no means a barrier to further nuclear development on either side: the US was already setting off more test explosions underground or underwater than in the atmosphere. Not only did the partial treaty fail to contain the arms race, it wound up clearing the way for its escalation. Despite the fact that Kruschev had given in to Kennedy's terms, right-wing politicians in the US accused the president of being soft on the Commies, The support of the Joint Chiefs of Staff was finally won by the administration's argument that forcing the tests underground, where they are more difficult and expensive, would hamper the Russian nuclear advance far more than the American one. But the real selling point for the hawks was Kennedy's pledge of lots of new, more sophisticated weapons. As limited as the treaty was and as sweetened with promises of arms escalation, it met with resistance in the Senate. George McGovern finally exclaimed in exasperation that "the Administration has been called upon to give so many assurances of our continued nuclear efforts… that a casual observer might assume we are approving this treaty so that we can accelerate the arms race and beef up the war-making facilities of our country." To most people, this judgment was not so clear at the time. Alva Myrdal, who had been instrumental in the multilateral push for a comprehensive ban, remembers, "I only gradually experienced this fateful turn of events as a rude awakening, So hopeful were we that we euphorically hailed this agreement as of utmost importance. We took it for granted, as we were told, that it was the first step towards the discontinuance of all testing of nuclear weapons." Later, Myrdal wrote that the partial ban "can hardly be considered among disarmament measures," though "it should be given some credit as a public health measure." The Partial Test Ban was greeted by the peace movement as its greatest victory. The campaign that had fed OT! the fear of fallout swallowed the Treaty hook, line and sinker. Then, unprepared to deal with any but the narrowest of nuclear concerns, it practically vanished. In the following years, underground testing proved adequate for the development of all kinds of new weapons. The most destabilizing of these were MIRVs, multiple independently targeted reentry vehicles, which allow a single missile to deliver numerous nuclear warheads to different targets. Because the number of warheads per missile can no longer be easily verified and because their precision makes possible a first strike against the other side's strategic missiles, MIRVs helped make arms control more unlikely than ever. Starting in 1967 and through the 70's, arms control centered on the Strategic Arms Limitations Talks (SALT). Two superpower agreements together known as SALT I, were reached in 1972: one limiting the deployment of antiballistic missiles and another limiting the increase in strategic arms. SALT II, signed in 1974 by President Ford and Russian President Brezhnev but never ratified by the US Senate, established a ceiling ori the number of MIRVs each side was allowed. None of the SALT agreements meant elimination or even reductions of weapons. On the contrary, in the words of Myrdal, "there is only a haggling over – marginal differences in their continued increase." In fact; the ceilings to which the superpowers agreed were amazingly close to the numbers they had planned to deploy anyway. No limitations at all were placed on tactical or conventional weapons or on qualitative improvements of strategic missiles or warheads. One difference between SALT and earlier arms control agreements is the extent to which commentators immediately saw it as a charade. In 1969, three years before the first treaty was signed, I.F. Stone wrote an article called "Why SALT Spells Fraud. " Myrdal comments, "By no stretch of the imagination can [SALT II] be called arms limitation. Instead it is a mutually agreed continuation of the arms race, regulated and institutionalized." Robert C. Johansen, president of the Institute for World Order, states that SALT II was a "clever managing device to enable the US and the Soviet Union" to channel their resources into the type of weapons with which they can best "increase their superiority over the rest of the world's governments." Anti-Euromissiles demo in San Francisco, 1983. Although arms control is little more than what Stone calls a "theater of delusion," we can expect endless curtain calls. Talk about arms control will keep pace with new rounds in the arms race. The arms control ritual allows each superpower to hail its valiant efforts for peace, efforts (each one laments) that have been tragically foiled by the other side. The basic decency of each government is affirmed and support for its ever escalating arms buildup -- and its other policies -- is assured. Thus legitimized, the superpowers are free to continue using the permanent nuclear showdown as they always have. Like the Cold War it complements, "arms control" is a device by which the superpowers control the governments of other countries, their allies, and their own populations.